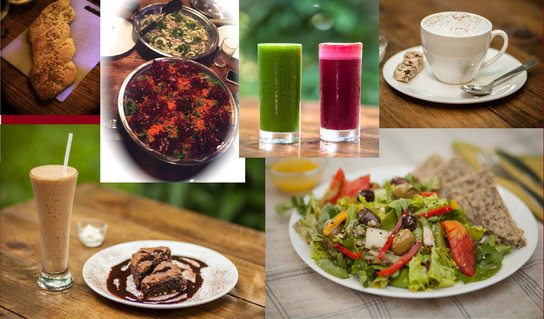 It is amazing how a spiritual quest could have a fortuitous outcome in the form of The Space Goa, a meeting ground for people where life can be celebrated, minds can merge and healing can take place through delicious health food and various healing therapies. The Space Goa is indeed a modern sanctuary just as Ritika Sikka-Niv visualised it. For Ritika it has been a journey of discovery and learning. This Punjabi woman made her way to Canada, where she spent twenty years of her life, in the course of which she became a pharmacist and set up an online pharmacy so that her clients could avail of medicines with ease. It was a hugely successful enterprise, but at the back of her mind there was the nagging desire to develop a place that would promote health and wellness. ‘My marriage fell apart and I was going through a tough time as a whole lot of things were going wrong at the same time,’ says Ritika, explaining the reason for her spiritual journey. She sold her business and began travelling from place to place, adding to her repertoire of educative experiences and building friendships with individuals who shared her ideas on holistic healing through traditional processes. She has participated in healing ceremonies in the jungles of Peru, South America and in the Vedic ceremonies of Rishikesh, India. She has worked with therapists at Osho Miasto, Italy and had juice cleanses in Thailand. Besides these places she has been to sacred sites in Israel and Australia too. During her quest she met and married her second husband, Eran and had a daughter, Zohar. ‘After having a child we decided it was time to settle in one place and we also wanted to give her a natural environment,’ says Ritika. Therefore, the couple settled in picturesque Palolem and The Space Goa came into being. Ritika is partnered in the enterprise by Ujallah who is the founder of ‘InLove’ therapy, based on discovering and setting free the true person within. The burdens of false expectations and unexpressed truths are released through a blend of sharing, meditation, dream work and pranic healing. ‘InLove’ therapy has been derived from Osho, the Kabalah, A Course in Miracles, Chinese medicine and the Red Road Tradition. The Space Goa allows Ritika to invite her teachers to dispense their various forms of holistic healing techniques, which include meditation and Yoga. Ritika has plans for workshops in plenty with a schedule already in place, mainly featuring those conceptualised by the ‘InLove School’ and led by Ujallah. Though envisioned as a wellness centre, the focus shifts to food but stays in the domain of health, with The Space Goa’s café and delicatessen. Ritika says, ‘We try to serve all organically grown food as much as possible.’ She explains further that the scarcity in the production of this type of food has led her to go as far as Auroville for her jams and preserves. Some products are obtained from Karnataka forest co-ops of women, and then there are people in Cotigao who supply spices. Many of the products are prepared in the deli such as, different types of bread, biscuits, and gluten free cakes. Chef LJ has her own brand ‘Mother Pukka’, under which she prepares and packages Cheeky Chili Jam, Ginger Preserve, Onion Marmalade and other food items. Expatriates make their contribution by selling their organic produce. ‘We had a French couple who used to make different kinds of cheese and sell them to us,’ says Ritika. The Space Goa will also be selling organic make-up, shampoo as well as other body care products. Organic clothes, sheets and towels will be on sale too. Ritika is very proud to contribute in a small way to providing employment to Goans. ‘Of the six people working for her only one is non-Goan. My raw food chef is a Goan too,’ she beams. The café lists an exotic menu which has a price range starting from Rs. 90 to Rs. 280. This seems quite reasonable taking into account the expensive ingredients that go into creating the finished product. You are spoiled for choice even with something as simple as porridge. It is offered with an option of oats or amarnath (bajra). ‘We have stopped serving tuna due to overfishing but customers do want non-veg so we have chicken and salmon dishes. We haven’t gone completely vegetarian,’ states Ritika. The food is nowhere close to Goan cuisine. One would assume it would take a discerning palate or a health food addiction to frequent The Space Goa, but the food is absolutely delightful to the taste buds. Chocolate and beetroot cake, one of chef LJ’s specialities, is not just delicious it has no trace of the taste of beetroot: health in a delectable serving of food! There is a whole array of salads, sandwiches, coffee (cappuccino, caffe latte, espresso, etc.) and tea (masala chai, iced tea – mint julep, pineapple spiced or lemon grass) to treat yourself to besides mezze dishes from the Mediterranean region. These present a range of small dishes which is good for people coming to eat as a group. The health drinks, which are Ritika’s area of expertise, include juices like Beet Basic with beetroot, carrot, apple and ginger and smoothies such as Cosmic Trigger, concocted with pineapple, orange and banana. These health drinks aim at energising, cleansing and boosting the immune system. The customers are, of course, limited to those who are health conscious. The ordinary Goan would not choose to frequent a place like The Space Goa. This, however, does not deter Ritika in any way. She has a sizeable clientele that satisfies her. In time, with health awareness spreading gradually, there is no doubt the number of her customers will increase too.